As self-deprecating as they probably are, this band is not at all boring. 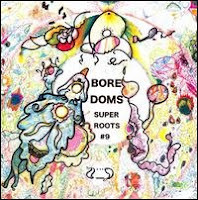 Hailing from Japan, the Boredoms latest album, Super Roots, Vol. 9 is another dose of noise rock to relieve us of our boredom with the cookie cutter mainstream music. The entire album is live, so there are occasional cheers but it doesn’t interfere at all. Blending together angelic voices, tribal beats and a mesmerizing, transcendental sound, they sound like an inspired gospel group rocking out. Towards the end of the one, forty-minute track on the album, the beats start to pick up more, but the end is as soothing as sleep.